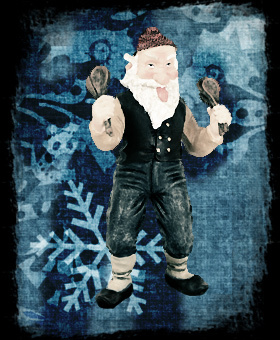 On the 15th day of December it’s Þvörusleikir’s (Spoon Licker) turn to come down from the mountains. Þvörusleikir is a very malnourished-looking fellow. No wonder about it: all he likes is licking spoons! How can’t you feel sympathetic though? I reckon we all at least once in our lives had occasion to lick a spoon that had been used to stir something particularly appetizing and enjoyed it. But Þvörusleikir likes wooden spoons and wooden spoons are hard to come by these days. If you have a wooden spoon in your house, you should do this poor fellow a favor and leave it around. But remember to dip it into something worth it.